Mfinanga, G.S. ; Ngadaya, E.; Mtandu, R.; Mutayoba, B.; Basra, D.; Kimaro, G.; Chonde, T.M. ; Ngowi, P.; Mfaume, S.; Kilale, A.M.; Egwaga, S. & Kitua, A.Y. This study was carried out to determine the rate of agreement or disagreement of microscopy reading and culture positivity rate among smear positive and negative specimens between peripheral tuberculosis diagnostic centres (PDCs) and Central Reference Tuberculosis laboratory (CTRL). 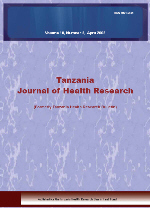 In this study 13 PDCs in Dar es Salaam, Tanzania were involved. Lot Quality Assurance Sampling (LQAS) method was used to collect 222 sputum smear slides. A total of 190 morning sputum specimens with corresponding slides were selected for culture. First readings were done by technicians at PDCs and thereafter selected slides and specimens were sent to CTRL for re-examination and culture. Culture results were used as a gold standard. Of 222 slides selected, 214 were suitable for re-examination. Percentage of agreement of smear reading between PDCs and CTRL was 42.9% and 100% for positive and negative slides, respectively. Measure of agreement (Kappa statistic) was 0.5, indicating moderate agreement. Of 190 samples cultured, percentage of agreement between smear reading from PDCs and CTRL was 37% and 88.9% for smear positive and negative slides, respectively. Kappa statistic was 0.3 indicating poor-fair agreements. Comparison of smear reading from PDCs with culture showed sensitivity of 36.9% and specificity of 88.9%. Comparison of smear readings from CTRL with culture results showed sensitivity of 95.6% and specificity of 98.6%. In conclusion there was inadequate performance in diagnosis of TB using smear microscopy among peripheral diagnostic centres in Dar es Salaam. This calls for immediate and rigorous measures to improve the quality of smear microscopy. It is therefore important to strengthen the capacity of laboratory personnel in smear microscopy techniques through supportive supervision and training.